I live in Phoenix, which means it is hot 80% of the year and the rest of the year it is just mild. This means that if there is ever a natural disaster or emergency, water is going to be the most important item for survival. One of my recent goals has been to make sure my family is prepared for an emergency. Knowing that my family has the tools and resources they need to survive a natural disaster is really important. How much water does an average person need a day in an emergency? The standard rule of thumb is that each person needs 1 gallon of water per day. This is assuming that you will drink at least 2 quarts (1/2 gallon) and use the rest for personal hygiene or cooking. Obviously the more water you have the better, but 1 gallon of water a day is a great starting place. 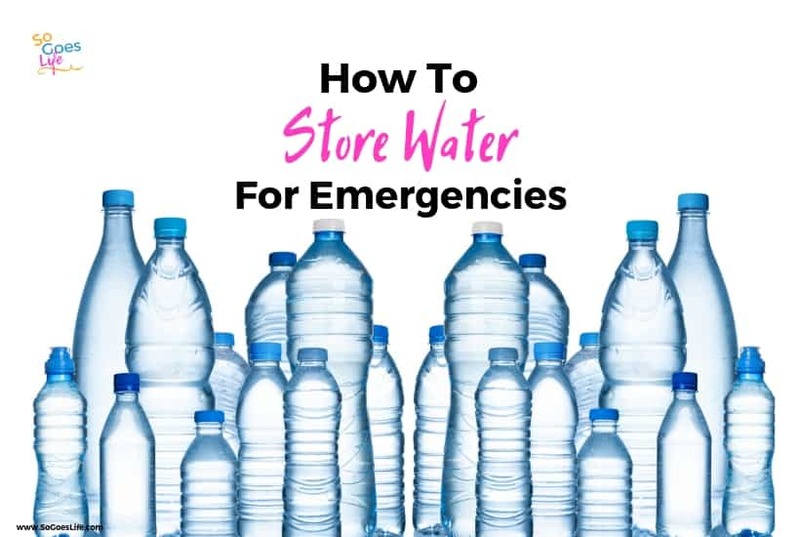 How much water do you need to store for an emergency? This is where it gets very subjective. The problem is that you never know how long an emergency is going to last. The typical recommendation is to store enough water to last for 3 days to 14 days. That means you need anywhere from 3 gallons to 14 gallons per person. When you are putting together your water storage plan also remember that water is heavy. One gallon of water weighs 8 pounds. It is best to have a mix of mobile and stationary water sources. Once you figure out how much water you need, the big issue is what is the best way to store water long term. Purchasing water from the store is the simplest way to get started. It is also the most expensive. If you purchase a typical 24 pack of individual water containers that are 16.9 oz, you’ll end up with 3.17 gallons of water. If you purchase one package a week for four weeks you’ll have a three day supply for 4 people within a month. This is a great way to get started and the water can easily be rotated as you use the water during the normal course of your life. 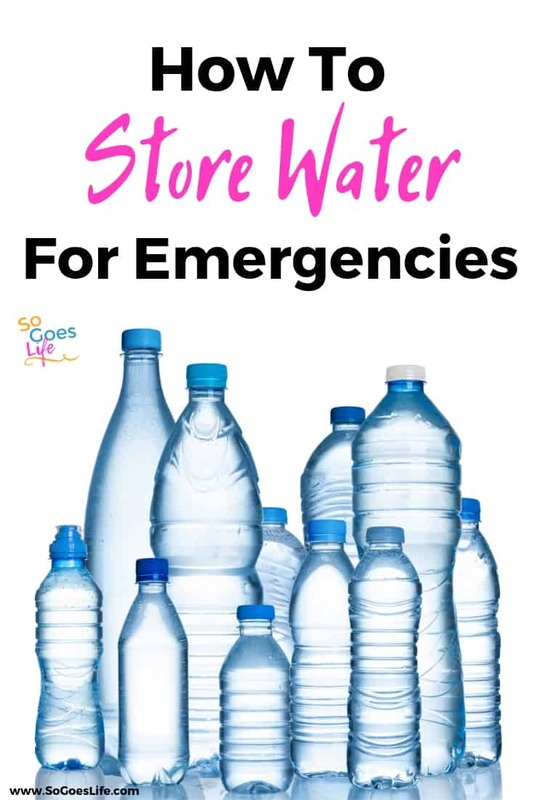 Most grocery stores also have a mix of 1, 2.5 & 5 gallon water containers you can purchase depending on your needs and space. Purchasing water from the store can get expensive if you are trying to get a full 14-day water supply. For this reason, you may want to consider reusing existing containers as part of your long-term water storage management plan. I reuse soda containers, juice containers, water, and Gatorade bottles. When reusing containers make sure they are food grade plastic bottles. You want to look for the high-quality stuff, that is made from heavy-duty plastic. You can also reuse glass as long as it was used for food previously. I personally avoid using stainless steel containers since you can’t use bleach. I also avoid using standard milk jugs, the plastic is too lightweight in my opinion. • Thoroughly wash containers with warm soapy water. • Sanitize the container by using 1 teaspoon of liquid bleach (standard household bleach – 5.25% sodium hypochlorite) in one gallon of water. Pour this solution into the container and let soak it soak for 2-3 minutes, then drain and rinse with regular drinking water. • Let container dry and then refill from a safe water source (hopefully your kitchen tap). • Cap the lid tightly to avoid contamination. • Label each container with the words “Drinking Water” and the date stored. • Rotate water every six months for best freshness and taste. If you have room the larger 5-7 gallon water jugs are an ideal solution. They are large enough to store a lot of water but small enough to still fit in various corners of your house. They are also still light enough to carry. The larger water containers are designed for long-term storage, they are typically dark blue in color which helps restrict light and prevent algae growth. They should come sanitized already, but I still washed mine out with warm soapy water to be on the safe side. Once you have filled them follow the steps above to make sure you water won’t become contaminated. We use them all the time for camping which makes it easy for us to rotate our water frequently. Keep in mind that if you are filling them from your garden hose that you need to purchase a special water safe drinking hose. Typically, garden hoses aren’t designed for drinking and often contain chemicals that aren’t healthy and can contaminate your drinking water. I use the water hoses that are designed for boat and camper use since they are thicker to block light and lead-free. This is another water storage method that we use. I currently have 6 barrels in my garage, but only have water in 3 of them. The larger water containers are awesome just because of the sheer amount of water you can store. However, they are big and not everyone has the space to store them. Also be aware if you are using the larger barrels that you’ll need a pump to get the water out. Once the barrels are full they are heavy, heavy, heavy. I can’t even move them at all once they are full of water. Because of the size of the large barrels most people end up storing them in their garage. I’ve read a ton of reports saying you shouldn’t store them on cement floors. It isn’t the cement floors that cause issues, but the heat from the cement floors which can cause chemical leaching into the barrels. Since we live in Phoenix this is a huge issue. We’ve got our barrels on pallets, but I’m hoping to get my husband to build me some storage racks at some point. A WaterBOB is a fillable plastic container that goes into your bathtub. In the case of an emergency, you can fill the WaterBOB and have around 100 gallons of water. I love the concept of the WaterBOB and think it is a great idea, but have a few issues with depending on it entirely. Sometimes when an emergency hits you don’t have time to fill up your bathtub. Another problem is getting the water out of the WaterBOB. It has a small hand pup included, but based on the reviews I read can be very time consuming to use. The biggest issue I see with the WaterBOB is the fact that it is hard to test. The WaterBOB is designed to be used once. Which means if you use it once then you are out of luck. I was able to find a few reviewers who were able to dry and repackage it, but they all said it was a lot of work and kind of a hassle. However, if you are short on space I think it could be an amazing option. You just want to make sure you get it filed asap if you have a hurricane coming your direction. One of the biggest issues with water storage is water contamination. Water itself doesn’t go bad, it goes bad from other sources. Even if you do everything right there is a chance your water will become contaminated. Contaminated water can make you very, very sick. In an emergency situation, one of your top priorities needs to be keeping your water source clean and pure. Water from contaminated sources must be disinfected or purified before use. The two most common methods of purifying water are using liquid bleach or boiling the water. Before you begin the purification process first remove any visible particles. 1. Let particles settle to the bottom of your container. 2. Strain water through a cloth or a layer of paper towels. I typically use a bandana. Depending on how bad the issue is you can also use coffee filters. Boiling is a great way to purify water. Simply bring your water to a rolling boil for 1 to 3 minutes. After the water has cooled fill your containers. Sometimes boiled water can get a flat taste. Boiled water will taste better if you put oxygen back in before drinking. To restore oxygen to your water pour the water back and forth between two clean containers several times. Use household liquid bleach (5.25% Sodium Hypochlorite) to disinfect your water. Do not use bleaches that are scented, colorsafe or have added cleaners. Treated water should be mixed thoroughly and allowed to stand for at least 30 minutes before use. The water should have a slight bleach odor. If it doesn’t you’ll need to repeat the dosage and let the water stand for an additional 15 minutes before use. Unfortunately treated water doesn’t always taste the best. You can use water flavor packets to help hide the taste. However, in an emergency situation, I recommend using water additives very sparingly since it takes more energy for your body to process. I’m a huge hiker, so my husband and I have used a variety of water filters over the years. Personally, I think water filters are a great item to add to your water treatment options. They are easy to use and over the years have gotten significantly less expensive. I’m currently using two types of water filters. I love, love, love my old Katadyn Hiker Pro Water filter. It is small, lightweight and can filter a decent amount of water with minimal energy. It has a carbon filter which helps to improve taste and will reduce chemical contaminants in your water. If you are worried about chemicals in the water and need a lightweight option it is a great resource. On my most recent hiking trip, I switched to the Sawyer Mini which was absolutely amazing. Talk about lightweight small and compact. It rocked. One of my hiking partners was also using the Katadyn BeFree Water Filtration System on a water bottle mount. It was super easy to use as well. Both options are inexpensive ways to filter water. Remember that they don’t have the carbon filter, so they are best when used in areas with minimal chemical water contamination. Another option that I don’t have but have used with friends are gravity filters. If you need to filter larger amounts of water for bigger groups the gravity filters are the way to go. You can quickly set up the system and then let gravity do all the work. If you have ever used standard filters (like the Sawyer and Katadyn) you’ll know why gravity filters are amazing. I love my two filters, but it does take a bit of work to filter the water. A gravity filter is definitely next on my list. I’m just waiting for the right trip. What about using Pool Water? I get this question a lot since we live in Phoenix and so many people have pools. Technically you can use your pool water for drinking. In most cases, your pool water is 2 parts of chlorine per million. We can drink 4 parts per million and be safe. Here is the deal though, in a natural disaster how long can you keep your pool water safe? Depending on the disaster you may have storm debris in the water that makes it dangerous to use. Without power, your motors will stop working which means your chlorine won’t circulate and the filters won’t be working. I’ve seen pools with broken filters and they get nasty really, really fast. Another thing to consider is your surrounding community. If thing get bad quick and people know you have a pool you are going to be a big target. Personally, I would rather not depend on my pool water. What If I Have a Salt Water Pool? Salt Water pools have similar issues as chlorine pools in terms of keeping the water uncontaminated. Typically salt water pools are undrinkable unless you have a water desalination unit. These units can be expensive and require a decent amount of upkeep. You can purchase a solar water distiller but keep in mind that they typically only produce 1-3 pints of water a day. In an emergency situation, this isn’t even close to enough water for long-term survival. In most situations, saltwater pools are a great resource for personal hygiene – which is a huge plus! Water doesn’t spoil, contamination is what causes issues.